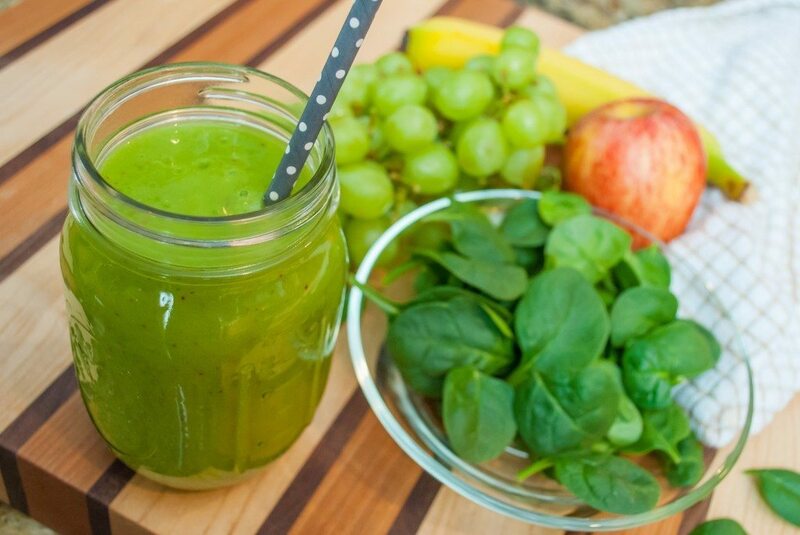 Blend Up a Cup of Good Health! This past weekend, I enjoyed a family barbecue complete with uncles, aunts, cousins, babies and toddlers. One of my cousins is a mom to a set of twins and she is always in need of a creative snack. I watched her as she tried to find something to tame her son’s ravenous sweet tooth (even after the chocolate chip cookie). She had to come up with something fast. After all this two-year-old’s patience was wearing thin and so was my cousins’. She took out a blender and created a fruit and veggie smoothie that would just knock your socks off! She loaded the blender with a few scoops of fruit salad (watermelon, blueberries, strawberries and cantaloupe), two handfuls of fresh baby spinach, and topped it off with about a cup of ice cubes. The result was a beautiful green beverage! Next stop – the sippy cup and this two-year-old couldn’t be happier. After tasting this delicious super-nutritious beverage of fruits and spinach I thought, what a wonderful way to get in more fruits and veggies; this drink is packed with disease-fighting antioxidants! If a two-year-old gobbled it down without so much as taking a breath, it must be tasty enough for everyone to enjoy. My cousin didn’t stop there-she took out some homemade frozen pops from the freezer that was created from the very same recipe. Brilliant! After a few sips I began to think about all of the different ways you can blend yourself a cup of “good health” that’s delicious, cool and refreshing, and of course satisfies a sweet tooth. Spinach is an excellent source of fiber and vitamin K; high in vitamins A and C; high in iron, high in folate and a good source of magnesium. Bananas are rich in potassium and carrots contain an excellent source of vitamin A and a good source of vitamin C.
Place all ingredients in a blender, blend until smooth. Enjoy!